Here at Perfect form fitness training we look to provide a comfortable clean environment in which we can help you to achieve the body and or fitness you desire. Our PT studio is very private and is located at 4 Glencarron crt, Capalaba. 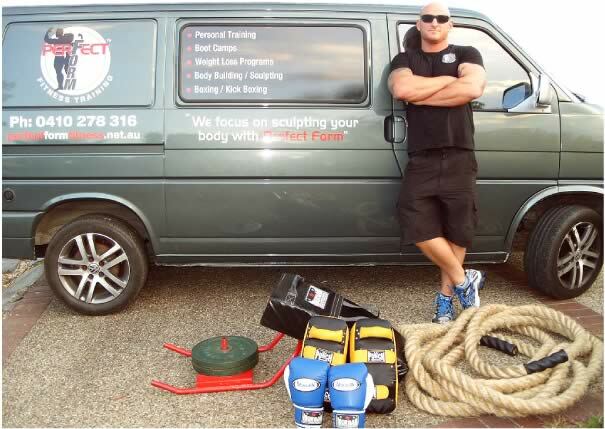 Our trainer Ash is fully trained, insured and registered with FITNESS AUSTRALIA. We are quite versatile and can offer PT sessions: at our studio, at your place, at a local park and even at some workplaces. Ash is very passionate about fitness and all his energy is focussed on you during your sessions. PERFECT FORM to achieve your bodies PERFECT FORM. We do this by focusing on teaching you how to carry out exercises in a correct and safe manner. Many people are under the impression that to gain muscle you need to lift the heaviest weights you can find. Well this is far from the truth. Lifting these weights that are too heavy will only compromise form and open the gateway to injury. Many females think that lifting weights will make them bulky and manly looking. This too is another myth. Weight training is researched as being ‘the fountain of youth’ delaying the onset of ageing. Weight training increases lean muscle, speeding up the metabolism which assists in weight loss, in addition shaping the body. Weight training strengthens bones preventing the onset of osteoporosis, weight training assists in preventing many cancers, diabetes, heart disease, stroke and the list goes on-this is all researched fact. Our sessions include warm up/down, stretching and generally run for 40-60min (comp training sessions are 60-90min). We are able to offer really competitive prices and are much more cost effective than other going rates.